In S8, Dean gets a new navy blue utility coat. This one has more decorative elements than his old one. You can see the snaps on the breast and lower pockets. There are decorative “half snaps” on the corners of said pockets as well. The shoulders have a stylized seam across them. It does up with both a zipper and a securing over-flap of snaps to cover the zipper. There are also wrist cuffs that do up with snaps. There is also a built in belt underneath the outer layer of material that can be seen from the back of the jacket and just above the lower pockets at the front, so that it can be synched at the waist. This is the same make and model jacket as Dean’s S8 Green Utility Coat. In Southern Comfort (8x06), this jacket first appears at the beginning of the episode when Sam and Dean are getting a snack and Dean finds the job. He wears it again in the episode when they go to the graveyard to find and take care of the bones and at the end of the episode when Dean says goodbye to Garth. In LARP and the Real Girl (8x11), Dean wears this jacket in the car at the beginning of the episode, and then during the scene where they say goodbye to Charlie after the case is wrapped up, and Sam decides that they should stay for the Battle of the Kingdoms. In The Great Escapist (8x21), we see fake!Dean wearing this jacket. In his second scene, we see fake!Dean put the jacket on when he and fake!Sam are leaving to get Kevin food. In Dog Dean Afternoon (9x05), Dean wears this coat when he and Sam travel back to the pound to talk to the other dogs, once Dean has taken the potion. He wears the coat for the rest of the episode. 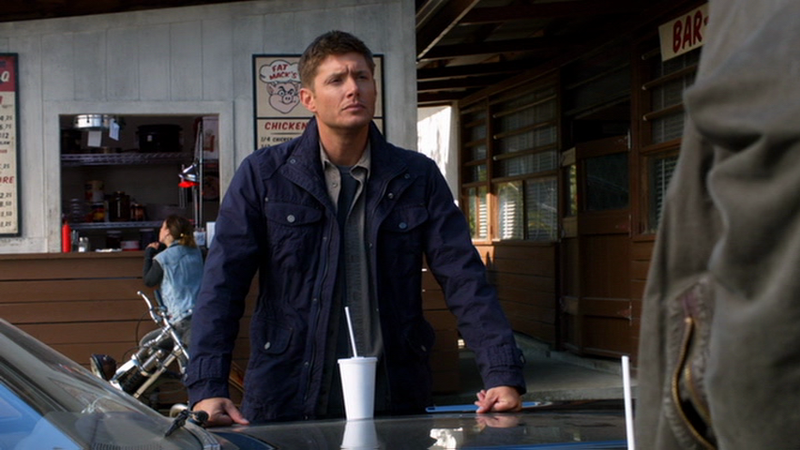 In Road Trip (9x10), Dean wears this jacket when he, Cas, and Crowley leave the bunker to go find Sam. In Alex Annie Alexis Ann (9x19), Dean wears this coat from when he and Sam arrive in Sioux Falls until they escape the vampire nest after Jody rescues Alex. In Stairway to Heaven (9x22), Dean wears this coat when he is preparing to leave the Bunker towards the beginning of the episode. He briefly wears a suit, before changing back into this coat when he starts interrogating Cas’ angels. He keeps it on until the end of the episode. In Do You Believe in Miracles (9x23), Dean wears this coat for the entire episode, except for the very final scene where we see that Sam removed Dean’s coat before putting laying him down in the bed. In Reichenbach (10x02), Dean wears this coat when he leaves the stripclub, he keeps it on until he leaves Crowley. When we see him playing piano at the bar, he is not wearing it. In The Executioner’s Song (10x14), Dean wears this coat whenever he is outside the bunker and not in a suit. In Dark Dynasty (10x21), Dean wears this coat when he goes out to get pizza and also when he comes back after failing to track Elton down, and confronts Sam about his secrets. He then wears it until the end of the episode. In The Prisoner (10x22), Dean is still wearing this coat at the beginning of the episode, when they have Charlie’s funeral. He then switches coats. In Plush (11x07), Dean wears this after he changes out of his suit and goes to Rita’s house for the final time to confront her after she withheld information about her brother. He keeps it on until the end of the episode. In Red Meat (11x17), Dean wears this coat from when he and Sam go to check out the cabins, until he’s tazed by the sheriff and brought into custody. He wears it again when he’s discharged from the hospital and Sam calls him, and then keeps it on until the end of the episode. In Somewhere Between Heaven and Hell (12x15), Dean wears this coat when they go into the woods with Crowley to hunt the Hell Hound. He wears it until the end of the episode. In Twigs & Twine & Tasha Banes (12x20), Dean wears this coat when he and Sam meet up with Alicia and Max. He takes it off briefly when they’re in the B&B hanging out with Tasha, then puts it on again when Sam comes back from getting take-out and calls him out to the hallway to talk about the missing person posters he found in town. He wears it until the end of the episode. FATE: When Dean is stabbed in Do You Believe in Miracles (9x23), this coat gets very bloodstained. I am going to have to look into Esprit's coat line. I really do like this coat. They don't look like women's coats, what with the straight lines and all. Usually women's coats are more sculpted. Apparently this one is "Misses Military" - at least that was what it was called on the retail site that my researcher sent me. I guess the main thing is that cinch-option at the waist. For some reason that seems to mark it more as a woman's coat. I wonder if it has less interior pockets... that always bugged me about womens coats. They seldom have interior pockets. Yes, do love the interior pockets. As I own so few coats, and most of the ones I do have are men's, I didn't realize that women's coats don't necessarily have an inside pocket. I do love pockets though, whether inside or outside. Can't find any of these coats! I realize some items may be discontinued but have you had any luck finding any of the coats these guys wear for sale? I'd be happy if I just had one! Any help with the item model name or number to go with the Brand name is greatly appreciated! Re: Can't find any of these coats! Unfortunately, I'm not a collector, so I really have no idea where collectors find these coats. The brand information is just what people tell me, so if they don't tell me a style/model number, than I don't know it. My guess is that mostly all of their clothes have been discontinued and your best bet is looking through listings on ebay - or hitting up thrift stores and hoping to get lucky.